This is a short tutorial about improving performance by implementing Frustum Culling and Occlusion Culling. // Needed because a loaded Model is shared between several entities. Note: This implementation requires the Triangle Content Processor, which generates a Bounding Sphere once before starting the application. Calculating the Bounding Sphere at runtime would result in unnecessary performance losses. Occlusion Culling is a related, but far more advanced, performance technique. The idea is filtering objects hidden by other objects and don’t sent them to the video card at all. XNA provides the OcclusionQuery class for this purpose. 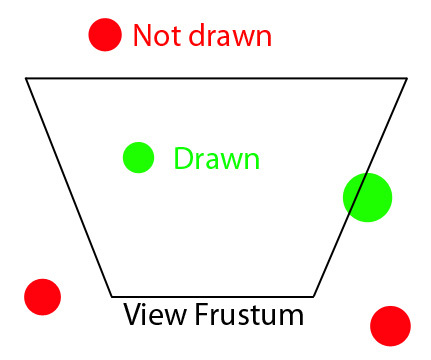 It determines how many pixels of an object were actually been drawn during the last scene. A low-polygon-version of an object or its bounding shape is used to accelerate the occlusion query. Please note that any performance boost of Occlusion Culling strongly depends on the application, since additional computation is required in the first place. „Using GPU hardware queries to cull occluded objects is a pretty advanced scenario. If you aren’t extremely careful, you can easily end up with pipeline stalls costing way more time than the culling saves you. 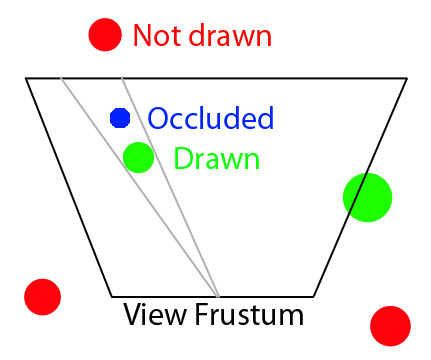 For the vast majority of games (and for anyone who doesn’t have a pretty deep understanding of how the GPU hardware pipeline works), I would recommend doing CPU culling using some kind of hierarchical spatial partitioning (such as an octree or kdtree) against the camera frustum. A common scenario of Occlusion Culling are Lens Flares, please have a look at the example on AppHub.